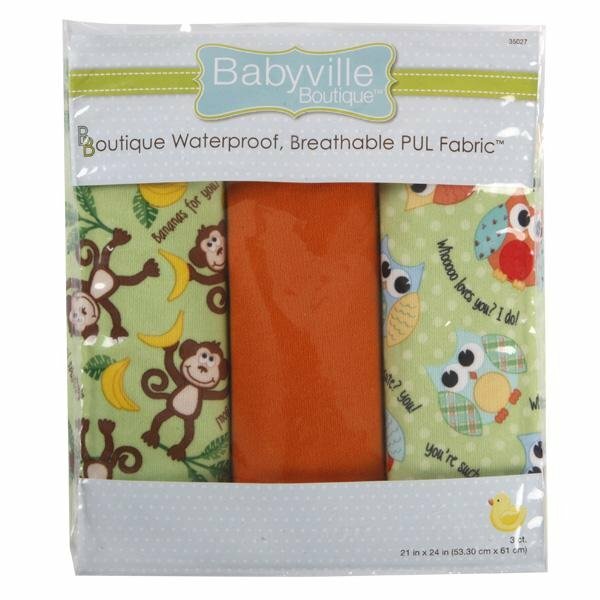 Playful Friends Monkey and Hoot printed and solid PUL (Polyurethane laminate) packaged fabric is soft breathable and waterproof. 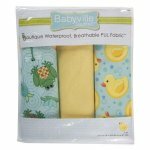 It is the perfect choice for sewing cloth diapers – cloth diaper covers – bibs and wetbags. The laminated backing makes it a superb choice for children’s apparel – pet projects – kitchen and nursery décor. Some additional projects for using PUL are diaper pail liners - rain ponchos - wipes - pouches - changing pads - protective covers for furniture and car seats – pet crate covers and bedding . An ideal choice when sewing projects for special needs children and adults. 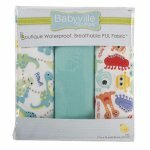 Coordinates with other Babyville Boutique products including Fold Over Elastic – EZ Adjust Tape and Tabs - Appliques – Labels- Ribbon- Iron-Ons. Machine wash warm – you can periodically use hot water for extra sanitation. Do not use fabric softeners or other additives. After laundering line dry or machine dry on low. In addition the waterproof surface can be easily wiped clean with a wet cloth. If pressing is necessary, press fabric side of PUL with a steam iron no hotter than a cotton setting on an ironing surface with a cotton cover. Make sure Iron does not touch the coated side. Press evenly using plenty of steam but no starch or sizings. Use regular scissors or straight rotary blade to cut PUL. Do not use pinking shears or decorative blades. When sewing - pin only in the seam allowance or use clips for holding fabric together. Use size 11 Ballpoint or size 10/12 Universal sewing machine needle. Use a good quality polyester thread. After sewing – it is important to seal needle holes by placing project in dryer on high heat for 20 minutes.